Waitangi Day on 6 February in Aotearoa New Zealand celebrates the Treaty of Waitangi, the nation’s founding document which was signed between the British Crown and the Māori chiefs in 1840. Waitangi Day is considered a national day of Aotearoa New Zealand. On Waitangi Day 2019 we remember and pray for all the peoples of New Zealand. 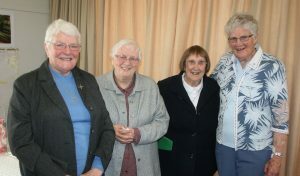 We especially give thanks for our Brigidine Sisters who have lived and faithfully ministered in New Zealand since 1898, their families, friends and past pupils. In the unfolding of time You led the Maori people and many people to find their home in Aotearoa. Draw together in tika (justice) and aroha (love) all who call this land their own. We ask this through our Lord Jesus Christ, Your Son, who lives and reigns with You in the unity of the Holy Spirit, for ever and ever. Amen.